For more than a generation, many of us have reluctantly embraced corporate subsidies in distressed communities on the theory that attracting an outside company is better than none at all. We’ve supported grants, tax breaks, tax-increment financing, municipal bonds, capital improvements, and whatever else it took to “attract and retain” a global giant. Even when the company has an awful track record with community development, like Walmart siting mini stores in inner cities and putting existing neighborhood retailers out of business, we have been willing to say yes if a community benefits agreement compensates at least some of the losers. Please. This is a fool’s errand. It’s high time for us to reject, root and branch, all corporate welfare in economic development, and to focus exclusively on nurturing local business. For a 30,000-foot look at the economic development field, there’s no better person to turn to than Ann Markusen, director of the Project on Regional and Industrial Economics at the Humphrey School of Public Affairs, which is based at the University of Minnesota. Several years ago, she assembled the best thinkers in the field of economic development to explore the validity of the attract-and-retain approach and to offer reforms. The experts had diverse views: some believed corporate attraction deals were ultimately beneficial, some didn’t, and some withheld judgment. The resulting book of essays, Reining in the Competition for Capital, released in 2007, is perhaps the best assessment of the academic literature on incentives to date. Consider a recent nationwide competition to attract a Danish pharmaceutical company called Xellia. One of its suitors was Sarasota County, a warm, sunny enclave in Florida south of Tampa Bay. In the city of Sarasota, one of the largest population centers in the county, Ringling Boulevard commemorates the home base of the Ringling Brothers Circus and its famous school for big-top performers. But a 2014 investigative report in the region’s main newspaper, the Herald-Tribune, made clear that a different kind of circus was happening at the Economic Development Corporation of Sarasota County (EDC). In the previous year, the EDC office spent “eight months working almost exclusively” to lure Xellia, the newspaper reported. They made repeated trips to Denmark, treated Danish executives to the finest Sarasotan hotels and restaurants when they visited, and mobilized a huge incentive package of $137 million, only to lose to an even more obscene package from North Carolina. How many jobs was this elephantine deal going to bring to Sarasota? Ten thousand? Twenty-five hundred? Exactly 191. Put another way, the economic development department was prepared to spend $717,000 in public dollars for every new job, many of which would go to outside professionals who moved into the community. To appreciate the absurdity of this, consider that if the same $137 million were put into bonds yielding 5 percent per year, 191 Sarasotans could receive $38,000 per year forever, without ever needing to risk the intermediary of an unreliable outside corporation. To imagine what a more cost-effective and rational practice of economic development could look like, meet Lou Stein, a remarkable innovator who has toiled largely in obscurity in the Upper Ohio Valley, in the West Virginian corner of Appalachia. Over a recent period of five years, he created 300 to 500 jobs per year, not for $717,000 per job, but $500 per job. Stein understands what incentive supporters do not—that big businesses are no longer the significant job creators in the United States. In fact, once these businesses become publicly traded on Wall Street, they are rewarded by investors when jobs are cut in the name of increasing “efficiency.” The main sources of job creation are start-ups and existing small- and medium-scale businesses. National statistics back up Stein’s view. A terrific website called YourEconomy.org presents one of the richest and most nuanced sources of data on the relative impact of locally owned versus nonlocal businesses. (It’s worth noting, however, that this website and the data it uses defines “local” broadly as a business with a headquarters within the same state.) Look at job growth in the United States between 2008 and 2013 and you will find that all jobs in the country grew at a paltry rate of 0.8 percent. During the same period, locally owned businesses increased jobs by 1.2 percent. Nonlocal businesses actually reduced their jobs by 4.3 percent. One of the fastest-growing segments of the labor market is Americans choosing self-employment, according to Heidi Pickman and Claudia Viek in “Do-It-Yourself Economic Growth.” Those 26 million Americans run 88 percent of the nation’s businesses. “With less than 3 percent of outside investment, microbusinesses employ 260 percent more people than venture capital-backed firms and generate about 77 percent of the [gross domestic product] that venture capital-backed firms do,” according to Pickman and Viek, two leaders in the U.S. microenterprise movement. Though microbusinesses are generating more jobs, the average size of start-up firms is shrinking—from 7.6 employees in the 1990s to 4.7 employees in 2011. The probability of an outside company coming to the rescue of any community, fulfilling its promises of jobs and investment, and sticking around for the long term is slim, and it makes no difference whether the community is rich or poor. Moreover, the best way economically challenged communities will improve their overall economic condition is to embrace local small businesses. Because successful small businesses often grow into larger businesses, an entrepreneurial community made up of many small businesses increases the probability that it will ultimately enjoy larger businesses that pay better wages. Moreover, larger businesses that grow indigenously remain locally owned and offer a more reliable basis for economic growth than briefly attracted outsiders. Even when local businesses contribute less to the local economy in wages than do nonlocal outsiders, they contribute more in other ways, in the form of local taxes, local supplier purchases, and local charitable contributions, which cascade through the economy and generate greater income, wealth, and jobs. The economic multiplier “benefits” of local businesses may turn out to be more important to community prosperity than the “costs” of lower wages. Many of the most talented people in a community, particularly younger people, increasingly gravitate to companies that offer great opportunities rather than great wages. They are willing to take less pay, at least for a while, for independence and ownership. These “creatives,” as urbanist Richard Florida calls them in The Rise of the Creative Class, are important guarantors of global competitiveness. Another critical determinant of local prosperity is the strength of civil society through volunteer organizations, civic groups, foundations, and political groups. The state of Kerala in India, for example, has been able to achieve life expectancy and literacy rates that match Western standards without high incomes because of its dense network of social institutions. In Bowling Alone, Harvard’s Robert Putnam has made similar arguments about the importance of a strong civil society to ensure the prosperity of American communities. Local business communities, with rich intimate personal relationships, are more likely to foster this kind of social capital. I look forward to future graduate dissertations that might prove which of these theories, if any, are right. But clearly there’s compelling evidence that local businesses are associated with more social equality and more long-term prosperity. So how can economic developers promote local businesses in ways that meet or beat Stein’s $500 per job milestone? That’s the subject of my latest book, The Local Economy Solution, where I discuss 28 examples of successful “pollinator enterprises”—local economic development programs that actually pay for themselves. 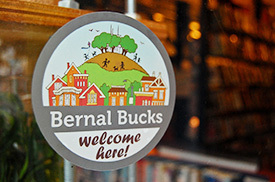 For example, rather than launch a buy-local program with a $100,000 grant, deploy a successful local debit card like Bernal Bucks in a small neighborhood in San Francisco, which uses fees from the card to pay for staff to teach card holders how to use it to promote buy-local behavior. Most of us, in our gut, know that corporate giveaways are a poor way to promote social justice. Now, there’s overwhelming evidence to prove it. No matter how small or how poor your community, skip the subsidy habit. Nurturing local businesses is the cheapest, fastest, most reliable way of growing income, wealth, and jobs. Michael H. Shuman is the author of several books, including Local Dollars, Local Sense: How to Shift Your Money from Wall Street to Main Street and Achieve Real Prosperity. For those of us “in the field”, these are old conclusions; the problem is, we don’t have a profession to represent what we know from experience. Instead, we have attorneys, pundits, & academics conveying these concerns, rather than those from practitioners in the CED field. On top of that, success is measured in business activity terms, rather than in socioeconomic terms. Public officials work for the Chambers of Commerce rather than for the taxpayer; they use private terms to seek public outcomes rather than understanding the public purpose responsibilities. Their metric for success is expressed in “economic development” jargon, which remains limited to business outcomes, in narrow ways, geared toward corporation benefits, not social/public ones. Regrettably, the planning profession is dominated by “urban” planners who focus on the built environment; we don’t see CED planners, nor care for their views, who focus on increasing standards of living & quality of life outcomes, in real terms. We have a long way to go before we get on the right track!